An accountant (who would prefer to remain anonymous for obvious reasons) explains how to get hold of corporate accounts and how to spot the tell-tale signs of corporate tax-dodging. b) It’s done for the same reasons – the non-payment of tax! It used to be legal to own people as slaves; does that mean it was right or that we should have continued to tolerate it? Of course not. The second criticism is subtle but even more important. I have often seen it displayed on the blogs and articles of well-read economists and as such it is often repeated as gospel. The criticism is that companies do not pay tax. It is only individuals that pay tax. I actually agree. Clearly all taxes levied eventually end up as part of the charge made for goods and services and since individuals are the end of the purchasing chain it is individuals that pay the tax. However this is only half of the story. Firstly not all individuals purchase the same goods and services but all purchase the basics. That’s why VAT is a regressive tax, duh. Secondly not all individuals bear the same burden of tax. It is often mentioned by the right wing that the rich do pay more tax than everyone else. Yes, they do as a single group when measured against other single groups. But let’s be clear those who own 80% of the wealth are not paying 80% of the taxes and that is principally achieved by tax avoidance. The mechanisms I will describe below are generally not available to mere mortals like you or I. They require a complex network of friends from privileged backgrounds and often cost tens of thousands to setup. It therefore only makes sense to avoid the tax if you have at least hundreds of thousands to hide. Since the crash in 2008 the richest 1,000 individuals have seen their wealth grow by approximately £155 billion. You can bet they did not pay much in extra tax as a result. Much of the current debate around tax has been reliant on others informing us of who is ‘dodging’ tax. Whilst there appears to be solid research confirming who these organisations and people are, it would help if people could decide for themselves whether their own company or clients or suppliers are involved. This guide is designed for the layman. It glosses over many of the subtle details that could invalidate calling a company or someone a tax dodger. However the tax strategies listed out here, if the company is using lots of them do indicate a propensity to dodge some amount of tax. Ultimately this is a guide; even if a company has a parent in a foreign country this does not necessarily mean it is dodging tax. To really know that you'd need to see the individual transactions. That being difficult to get hold of one can resort to simply calling their bluff and accusing them of it! So few people look at the company accounts apart from the finance nerds that companies assume the staff will not know what they are looking at. As such letting them know you are aware of the parent company in the Caymans can be a bit of wake-up call! You can download company accounts from Companies House for the cost of £1. From these accounts it is possible to identify likely tax avoiders. Alternatively buy one share in the company you're interested in. This entitles you to see a lot more information but you will then need to wade through the various piles of literature past the guff about their 'green policy' to see what is actually going on. The schemes listed below are indicators of tax avoidance. If the company you are studying is doing combinations or all of what sits below it is fair to regard them as probably being engaged in some form of tax avoidance. The most basic technique in tax avoidance is to raise costs. Sales or turnover made by the company is usually inflated to make the company look better and boost profits. This would incur a higher tax liability. So we should begin by looking for instances of companies raising their costs as this will squeeze profits. The first and most important way to do this is to ‘owe’ money to a parent company. Many organisations now have multiple companies doing lots of little jobs or working in specific markets. They may also buy companies doing work in markets they see a benefit in. As such over time the company may actually not be one single company but a group of companies. The parent is the organisation at the top of the pyramid. The organisation itself will own the companies underneath it. Look in the notes sections which are at the front or back. These will usually have a note related to ownership of the company. If there is a parent, where is that parent based? If it’s based in one of the many tax havens across the world it is more than likely using that parent to dodge tax. Wikipedia provides a good basic introduction to tax havens, which also includes a list of the main tax haven economies. Each of the smaller companies will be known as ‘associated’ or a ‘subsidiary’. An associate company is controlled by the same shareholders as the parent (more on that later). A subsidiary is controlled by the parent company itself. i.e. Phillip Green owns Arcadia Group (through his wife!) which own BHS. BHS is a subsidiary as it is owned by the parent Arcadia. If Phillip Green controls another company personally this would be an associate as it would be controlled by him personally and not by Arcadia Group. This distinction is important because it introduces a key way to shuffle money around and disguise the real benefactors. The tax avoidance comes in via Inter-company recharges or overhead recharges. By themselves these do not specifically mean tax is being avoided. Local government often recharges overhead to the local government company running your local swimming pool. They do this because they undertake work on its behalf. It is only fair that the swimming pool company therefore recognises this cost and pays the councils head office for it. What sets apart tax avoidance is that the intercompany recharges or balances are set to transfer funds in private organisations offshore. It will be easier if we use an invented example. Acme UK sells widgets in the UK. They make £500,000 profit and so would pay tax on this. The directors of Acme UK are not happy about this so they create Acme Group Co and register this in Jersey. Acme Group ‘charges’ Acme UK for the use of its brand name, patents and for loans that Acme Group has extended to it. These cost £750,000 per year. Now Acme UK books those costs against its £500,000 profit; is making a loss and can claim back tax. The money in the bank from the sales Acme UK has made gets paid to the bank account of the parent Acme Group in Jersey and in effect the £500,000 has moved abroad (and incurs no/less tax). At the same time Acme Co is left with a £250,000 debt on its books so that any future sales are already destined to be moved abroad and have no/less tax paid on them. So now Acme UK is not only not paying less tax it is actually claiming tax back previously paid for the ‘losses’ it is now booking. Look on the companies accounts for specific intercompany balances – note how big they are in relation to the overall size of the company. If the UK company owes a large balance to intercompany charges see if the parent company is stated in the accounts (see Parent Companies section above). Some companies bury their intercompany recharges in their debtors and creditors or receivables and payables. These are the statements of what the company owes or is owed by other companies. Crucially these amounts are stated when they have not yet been paid. A debtor/receivable is owed to the company – it is a sale made in the year which has not yet been paid. A creditor/payable is owed by the company for goods or services rendered which have not yet been paid. Even relatively small firms have become quite clever at disguising their profits this way by making the intercompany recharges on both sides. They owe money to the parent as a creditor but also are owed money by the parent or other companies in the group as a debtor. This can make it quite hard to unpick who owes who! In the notes it should state what the intercompany balances are as a % or amount of the total debtor/creditor balance. Deduct these figures from the debtor/creditor balance and you will get a real idea of how much money the company is actually making. I found one company in the UK which had £36m debtors and £32m creditors. But it had used such confusing systems of jumping money around that when I finally unpicked it all it actually had debtors of only 20% of the figure on the accounts and creditors of a similar size. In other words this company was actually nowhere near as big as they made out. The profitability was lower and yet because it was mainly intercompany balances their tax bill was a fraction of these numbers. They were able to show a larger profit and a larger company off the back of a tiny tax bill and it was all legal. You can see that booking these ‘loans’ will incur interest costs. Interest is accepted as deductible for calculating corporation tax. In other words if I take out a loan and pay interest on that loan it is legal for me to accept the interest as a cost, lower my profits and pay less tax. But what is a loan? How do you define whether a loan has been made? Is it the passing over of cash? Or that you owe the funds to a 3rd party? What if the investors provide services or an overdraft to fund or facilitate expansion? This 'loan', even though it is not from a bank allows the company to book the interest paid as a cost and reduce their profits. Using the example given before Acme UK directors realise that all the loans they have on their books from their investors are creating a tax liability. When they repay the investors, because they are based in the UK, those investors have to pay tax on the interest paid to them. Acme must also deduct tax at source and pay it to the government. To avoid this all of the loans are rolled up and paid off by Acme Group – in reality no money switches hands this is a paper transaction. You might hear this referred to as the reassignment of debt. The loans are considered paid off by Acme Group but now Acme UK owes Acme Group for the ‘new’ loan which paid off the old ones. Acme Group then receives the money offshore from the loan payments and pays it to the investors in their Jersey bank accounts. The money received is offshore and will attract no/less tax. Look on the balance sheet of the company, this is also known as the ‘consolidated statement of financial position’. This shows what the company owes and owns. The other side of this is the profit and loss or ‘income statement’. This is the statement of what the company has done in that financial year. The balance sheet will show the value of loans outstanding. What percentage of the total assets/liabilities of the company are these loans? Do they give a breakdown in the notes showing how many loans there are or whom they are owed to? See if you can find parent company loans or loans to specific directors or shareholders. These will probably be tax avoidance mechanisms. The profit and loss account will show the interest paid. What % of the total costs is the interest? Has it grown, did it appear or disappear in one year only to reappear the next? Compare this to other companies. Is it significantly more than its competitors? Different industries require different costs and ways of operating. Some industries will have high levels of debt not because they are doing something sneaky but because that is just how the industry generally funds itself. But if the interest is one of the biggest single costs in the company & if it is significantly more than its competitors you can bet there’s some tax avoidance going on. These are sometimes also referred to as ‘provisions, contingent assets or contingent liabilities’. Accountants have a number of ways of defining these but in essence these represent obligations of uncertain timing or amount. Let me give you an example. Acme UK has a contract which has worked out badly for it. The contract is not yet finished and it’s not yet certain of the cost it will pay. Acme UK has booked sales from this contract and therefore gained profit from it. However the contract is going badly and therefore it will not make as profit as it first thought. Acme UK is therefore allowed to recognise on its accounts that its profit has been reduced by this cost which has not yet been paid. HMRC does not allow for these kinds of provisions to offset tax (as they are not real yet!) but they form an important part of obfuscating what is really going on. All sorts of estimates and guesses about potential liabilities can disguise a.) what the company is actually earning and b.) what it actually owes. Most importantly by recognising these unpaid events the company has then legitimised the cost so that when it finally comes in they can book the cost against their profits and lower the bill. This may not seem a way to avoid tax per se but the key is this: What is a cost? A price is what you pay but a cost can be an opinion. If I have done work for someone or suffered loss through damage how do I tell how much money has been lost? There will be some straightforward costs from 3rd parties which I paid out of my bank account, fair enough. But there will also be my internal costs of handling the issue or problem. My estimate of these will be considered legitimate to book as a cost, but that’s just an opinion. I should create evidence that backs this up but with millions of companies and only thousands of tax inspectors how often will it be checked that what I have done is reasonable or true? Deferred tax is a particular contingent liability we should pay close attention to. It is the recognition of a tax attributable to temporary differences. This is the difference in value between the value placed on the accounts (it's book value) and its tax base (the value the taxman would consider legitimate). This does not therefore mean that any tax is owed right now. What it’s referring to is the possibility of having to pay that tax at a later date or the fact that the value of the assets or liabilities is different to what the tax man says. But why would the value be different to what the taxman considers? Well there are several complex and detailed reasons for the differences in the calculations but ultimately what one should consider here is how the company is valuing its future work and assets. If the deferred tax is an asset to the company then it may have written off a lot of 'damaged' stock which it is expecting to get a tax rebate out of. Alternatively if it is a liability then the company maybe over valuing its assets and is recognising that when it sells them it will owe more tax. Deferred tax is also used to estimate if the losses carried forward will actually be used up. In the UK certain types of loss have a time limit. You can't just use the same loss forever to hold off paying tax. Deferred tax will help to show the amount of tax they intend to pay or not pay next year. It will be in the profit and loss or Income statement under Other comprehensive income, on the balance sheet or statement of financial position it will be listed under non-current assets. These are assets (things the company owns) which are not physical. Things like brand or patents or its sales database will be included here. These are the assets the parent company will own and charge the other companies in the group for using. The key is how does one value this? Nike's brand is clearly worth millions but what is it? Is it the copyright for the logo; the name? How does one accurately price this? These brands do not get sold every day. Well there are several ways to arrive at a single number to buy it outright, but what of charging other companies for using it? Companies will often pay to have their brands advertised but that's not likely to be the price for you buying the rights to use it. Clearly this 'price' is something of a guess. It will depend on what the brand is being used for, what sales you might get from using it. Clearly there is scope here for invention. As such if a company has intangible assets listed, see if you can find out what these are. There may not be a list of the assets of the company which will make it hard to work out the change in value. Tangible (real physical) assets like buildings are often easier to understand than intangible as there are clear methods for working out the value of a building or a piece of machinery. But an intangible asset can be hard to define narrowly enough that one could be certain of its value. Intangible assets are always listed under total/long term assets at the top of the balance sheet/statement of financial position. You should also look for changes in the value of the assets on the income statement/profit and loss account. These would be listed at the bottom under Other comprehensive income or liabilities. These will show up how much the value has changed in any one year. If you know what the intangible asset is they may have written off the cost as a specific cost of goods sold. This would bury it in the accounts with a lot of genuine costs such as parts ordered, staff time etc. You may still be able to find it though if you look at the % of cost that these lines take up. Does one line seem to be 30% of cost one year and 45% the next? If so did sales also go up the same amount? Shareholders typically do not own shares in only one company. People who put their eggs all in one basket tend to find they lose out unexpectedly. Major shareholders of major companies almost certainly do not have all their eggs in one basket. As such they will set up companies to gather the income from this into one place. The key is to disturb the chain of money flows. A lot of people get paid very good money in the city to bundle assets into groups and classes which are then shuffled between various entities to such an extent that anyone trying to follow the money trail quickly gets lost. Statements of account typically do not list out individual shareholders or how much is owned by whom. However for very prominent companies the financial news may talk about a director’s remuneration being paid in company shares. Other famous owners like Phillip Green (Arcadia) or Lord Rothmere (Daily Mail) may well be known and their shareholdings or other activities listed out. See if they are the shareholders of associate companies or clients and suppliers of the main company. If it is an associate company they may be charging the parent for all sorts of services offshore which once paid disappear off the company’s books to somewhere you can't see them. But they will permissible to regard as costs, lowering profit and tax. It is not likely that these relationships will actually be on the financial statements. This is where you just have to dig and see what you connections between individuals and the companies they run you find. Follow the money - who owns the profit and to whom do all these charges for loans and brands get paid to? I've left the most obvious to last as the preceding part demonstrates how complex hiding these values can be and most importantly that just because the tax paid is low does not necessarily mean the company is dodging. It could be it's just had a bad year. Tax paid should be compared to previous years, turnover (sales) and as a % of operating profit or PBIT/EBIT. High sales figures do not mean high profit but if the tax paid as a % of sales changes look to see the changes from last year. Did costs go up a lot too, squeezing profit? If costs and tax paid was relatively the same but sales rose then what happened to the profit? Operating profit is the profit after all costs of goods sold but before operating costs and interest and tax. This is the profit the company makes on the job it was set up to do. If a computer chip maker invested in a bowling alley it would not include the income from the bowling alley in this operating profit as it is nothing to do with its normal everyday job. This profit margin is key because it strips out a lot of the funky accounting in interest for 'loans' or income and costs from overheads or odd sources. How much is the tax as a %? Does it change from year to year? After you include for overheads as a cost you then get PBIT (profit before interest and taxes) or EBIT (Earnings before interest and taxes). What is the tax as a % of this value? Corporation tax is between 20-24% of a company’s profits but the calculation determining this is so long winded and full of subtle variations that the key is just to see how much tax is actually paid compared to these profit margins. A lot of the major FTSE companies using these schemes pay tax rates of less than 5%, many as low as fractions of 1%. This really shows up the difference in tax avoidance being achieved. For a crude measure deduct the interest from the PBIT and then multiply that figure by 24%. Is what they actually pay in tax significanly less? If it is then the company is definitely bouncing something around! Be careful though as tax paid may include other taxes which are not taxes on profits such as National Insurance Contributions. Tax paid is listed on the income statement at the end after PBIT or operating costs. No doubt upon publishing this I will get some screaming banshee of a critic who points out the inaccuracy of what I’ve written in regards to IAS12 or the IFRS rules or UK GAAP. Yes well done, you’re quite right there are subtleties that complicate this picture and invalidate it to some degree. So I’ll repeat myself, this is a guide for the layman written by an accountant. As such I am not going to include the various academic debates surrounding classifications of derivatives under IAS39. If you’re that hot to trot well done, buy yourself a beer, I’m sure you can afford it. The accountant’s favourite answer is 'it depends'. So much of what is listed above does not guarantee that the company is dodging tax. Just because lines of cost go up one year to the next without corresponding increases in sales may just mean the company is investing money targeting a new market. It will reap the rewards in years to come. That said, if the parent is based in Jersey, you have large inter-company balances, a lot of interest paid to individuals or associated companies etc you can be fairly sure the company is not paying all of the tax that might be due were the taxman to be watching their every move. Keep your eyes peeled, read financial news concerning the market the company is in, buy a share and download their accounts and look at them. Happy hunting! The author is an accountant in an environmental company. On his days off he makes loud offensive rap music and stands outside government buildings with signs. Another Angry Voice is a not-for-profit website which generates absolutely no revenue from advertising and accepts no money from corporate or political interests. The only source of revenue for Another Angry Voice is the PayPal donations box (which can be found in the right hand column, fairly near the top of the page). If you could afford to make a donation to help keep this site going, it would be massively appreciated. What is... a Credit Default Swap? In case you weren't aware, the Conservative led government are attempting to push through a secretive amendment to carve open the entire NHS to privatisation. 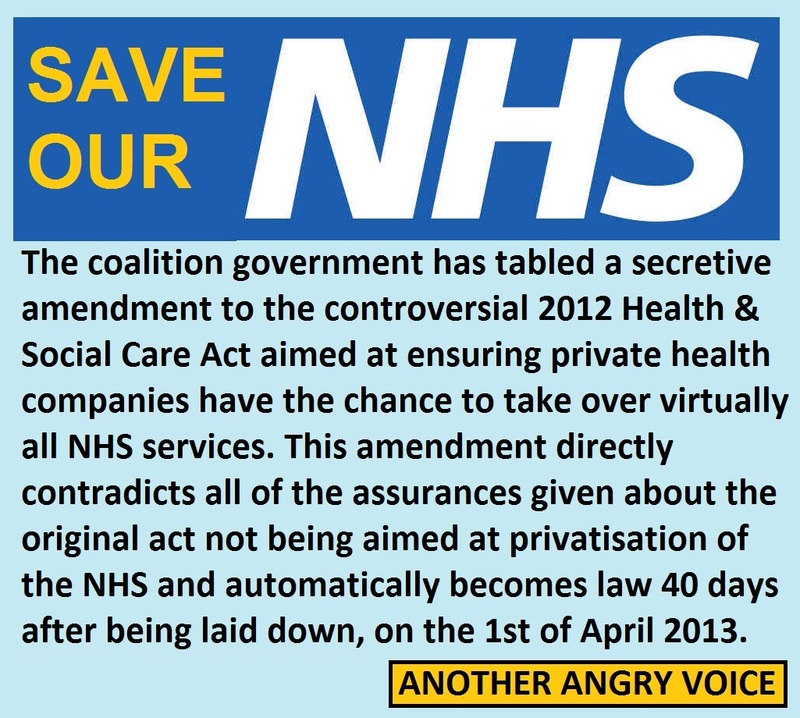 Amendment SI 257, to impose mandatory marketisation on virtually all NHS services, is subject to the parliamentary procedure of ‘negative resolution’, which means that it requires absolutely no parliamentary discussion or vote before it becomes law on the 1st of April 2013. I've already written a blog post explaining how this insidious piece of legislation will end up forcing NHS commissioners to put price before patient care and how it demonstrates the outright lies the Conservatives told to the public and the Houses of Parliament during the passage of the controversial 2012 Health and Social Care Bill. At the end of the article it also provides some suggestions on how you can help to stop this anti-democratic assault on the NHS. If you haven't already, please check that out here. One of the things that has really struck me is that despite social media being in uproar about this, and limited coverage in a few mainstream publications like the Guardian. The BBC has not covered this story at all. Now cynics might point to the fact that the Chairman of the BBC Trust (Chris Patten) is a Tory Lord with financial interests in the private health sector and that the Chief political editor at the BBC (Nick Robinson) is a former president of the Oxford University Conservative Association and served as national chairman of the Young Conservatives. The cynic might easily conclude that the BBC are not covering the story out of political bias. Another potential narrative is that the BBC have been castrated. They were always afraid to criticise the government of the day, simply because they rely heavily on continued funding, which depends on government decisions. However since the Labour party deposed the BBC top brass over the Andrew Gilligan accusations that Blair and Campbell had been "sexing up" the Iraq dossier to hype up Saddam Hussain's WMD's, they have behaved like a bunch of timid geldings. Others may counter the narratives that the BBC are biased in favour of the government or that they are cowed into subservience, by saying that "perhaps they just haven't heard about this story?". It's pretty difficult to imagine how this story of enormous national importance has passed them by, given the huge uproar on social media and the fact that they have scores of political journalists and dozens more specialising in health matters. Never mind how they've managed to collectively miss it so far, they may have been collectively avoiding Twitter and Facebook for all we know. In order that it is impossible for them to pretend that they don't know about it, I believe we must now contact the BBC to ensure that they certainly do know about it and demand that they give this story the headline coverage it deserves. Firstly, remember to be polite. Rude or abusive letters will do nothing but harden the stance of the recipient against the point you're trying to make. Be sure to mention amendment SI 257 to Section 75 of the 2012 Health and Social Care Bill. 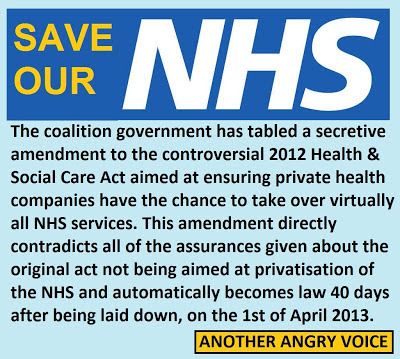 Explain that this amendment opens up virtually all NHS services to privatisation. Point out that this amendment is not subject to parliamentary scrutiny, nor a democratic vote. Tell them that unless something is done to stop the amendment to marketise the NHS before April 1st, it will become law. Point out that the legislation will legally require NHS commissioners to put cost considerations ahead of the best interests of patients. 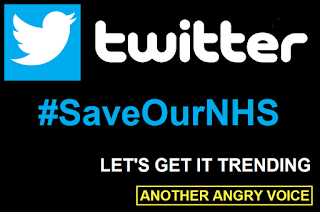 Tell them that you believe that the marketisation of the NHS is a story of undeniable national interest. Conclude by asking them why there has been no BBC coverage to date and whether they intend to do anything to rectify their lack of coverage. Ask them to respond to your concerns. You are limited to 140 characters on Twitter so you'll have to be concise. Ask them why the BBC is not covering the SI 257 amendment. In mid February 2013 the Department of Health quietly released a piece of legislation that will ensure that private health companies have the chance to take over virtually all NHS services. As a result virtually every part of the NHS will be opened up to the private sector. The SI 257 amendment to section 75 of the 2012 Health and Social Care Act will force NHS commissioners to put all contracts out to competitive tender, meaning that the private sector will get their pick of all of the most profitable NHS services. Astonishingly, this SI 257 amendment is subject to the parliamentary procedure of ‘negative resolution’, which means that it doesn't even need to be discussed or voted on, but will automatically become law 40 days after being laid down, which will happen on the 1st of April 2013. The Labour peer Philip Hunt (who served as under-secretary of state for health under Labour until his resignation over the invasion and occupation of Iraq) described this amendment as legislation which "fundamentally undermines the NHS and its very concept". Anyone remember the Tory posters with the slogan "we'll cut the deficit not the NHS" which were followed by £20 billion in NHS funding cuts leaving 17 hospitals with dangerously low staffing levels? How about "No more top-down reorganisations of the NHS" promise, which came a couple of years before the biggest top down reorganisation in the entire history of the NHS? "They did not believe they could win an election if they told you what they were going to do because people are so wedded to the NHS." There is absolutely no mention of "marketisation" in the Tory party manifesto, meaning that they deliberately hid their plans for NHS privatisation from the voting public in the run-up to the 2010 General Election. Had they revealed their true intentions towards the NHS it is certain that the Tories would have lost 100,000s of votes, meaning that they wouldn't have even been able to stumble into power with the aid of the Liberal Democrat coalition "partners". The defenders of this subversion of democracy love to point at the disaster at Mid Staffordshire (where hundreds of patients died needlessly due to inadequate care) and demand that the NHS is "reformed" because of it. However, the idea that mass privatisation of services and the raising of financial incentives before patient care would prevent similar disasters is as inane as it is irrational. The only thing that will be achieved if great swathes of the NHS are privatised to the cheapest providers will be an inevitable deterioration in care, and a certainty that any repetition of Mid Staffs (caused by giving primacy to financial considerations instead of patient care) will be carefully hidden behind the veil of commercial confidentiality (privatised services will not be subject to Freedom of Information requests). One doesn't have to look far to see what is likely to happen to the NHS if this amendment is allowed to pass. The private health care providers will use financial doping in order to undercut public services until the public alternative is eradicated, then whack up their prices once the competition is gone. Simply recall any of the other botched privatisations carried out by the Tory party in the name of "competition". Recall how post-deregulation private bus operators ran free services until the local authority services were abandoned, then assumed their lucrative monopoly positions and introduced above inflation price hikes every single year for decades. Recall how the railways were hastily carved up by a Tory government facing certain electoral defeat at the 1997 General Election, only to create a service which is fragmented and ludicrously expensive for the passenger (above inflation fare hikes every single year) and the taxpayer (now soaking up triple in corporate subsidies what the entire British Rail network cost to run pre-privatisation) alike. Recall how utility prices were supposed to be driven down through "competition" but instead the power companies simply behave like a giant cartel, all introducing eye-watering above inflation price hikes within weeks of each other. Polly Toynbee describes this compulsory marketisation of everything, regardless of local need as "ideologically propelled vandalism", I think it's even worse than that; there are scores of Conservative MPs and Lords with financial ties to the private health industry. This isn't so much an act of ideologically driven vandalism as an exercise in pure self-serving greed. It's not just the Labour opposition that are opposed to this privatisation of the NHS, the medical profession is firmly against it too. Recall that even before this SI 257 privatisation amendment, medical staff were united against the Health and Social Care Bill (the British Medical Association asked the government to withdraw it, the Royal College of Nursing passed a motion of no confidence in Andrew Lansley with 96% support, 69% of respondents to a 2012 Royal College of Physicians poll wanted the bill scrapped, with only 6% supporting it in its entirety). "This is about free markets, not healthcare. It is predicated on making money, not on doing the best thing. The NHS is a system that channels resources according to need. What the Act does is change it to a system that channels resources according to what makes money. Competition is the vehicle for changing it. I feel that it’s more important than ever that we do everything we possibly can to challenge the perversities of this marketisation. The money needed to run this new market will take away money from services." The most important step is to contact your local MP. If you include your full name and address they have a statutory obligation to respond to your communication. 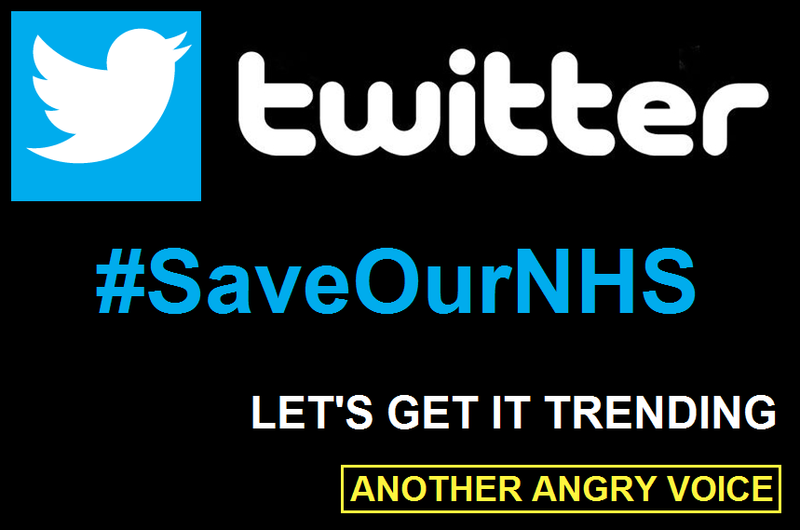 Feel free to copy and paste anything you like from this article and there are more hints and tips on what to say in this document from the Keep Our NHS Public campaign group. Without intervention the SI 257 NHS privatisation amendment will pass without discussion or a vote in either house, however any member of parliament could lay a "prayer" to start a motion to attempt to annul them within this time frame. With enough support, this could trigger a debate and potentially a vote in one of the houses. If you value the NHS you must implore your MP to support Early Day Motion 1104 to subject this legislation to parliamentary scrutiny. There are now two petitions on the 38 Degrees website please take the one minute it takes to add your name. The mainstream press will remain almost completely silent about this, it is up to the public to organise ourselves to spread the word about the ideological vandalism this Tory led government are intent on inflicting on the NHS. You can spread the word by using social media (Facebook, Twitter, Google+), raising the issue in chatrooms such as Mumsnet or even on the "other topics" section of Football club forums, using your email contacts or the good old-fashioned means of word-of-mouth. Contact members of the BBC and ask why this national interest story is not getting anything like the media coverage it deserves. Here is a list of BBC contact details. This compelling article on the open democracy website. The "bombard the BBC" campaign. When it comes to criticising George Osborne it is very difficult to know where to start. Perhaps the best place is his background? It should be quite clear (to anyone that is not a die-hard Tory tribalist) that George is unfit and unqualified for one of the most important jobs in the UK economy. He has a degree in History, some private sector experience of folding towels and simple data entry. He had a short and unsuccessful stint as a journalist before joining the Conservative party Research Department in 1994, establishing himself as a career politician. He was a speechwriter for William Hague (the first Conservative party leader in history not to serve as Prime Minister) and he was retained as a speechwriter and adviser to Iain Duncan Smith and Michael Howard (the second and third Conservative leaders never to serve as Prime Minister). He then became a close political ally of his Bullingdon Club chum David Cameron. He was Cameron's campaign manager for the 2010 election, the fourth consecutive Tory leader to have failed to establish a Parliamentary majority, despite the fact that the UK economy and the ruling Neo-Labour party were in absolute chaos. During his time at Conservative Central Office the party has failed to win a Parliamentary majority in four consecutive General Elections. In 2001 he was parachuted into the Tory safe seat of Tatton. Within years he became involved in the Parliamentary expenses corruption scandal, using public funds to fund his own personal property investments. As with so many other MPs, including his opposite number, shadow chancellor Ed Balls, he escaped punishment for his brazen abuses of the Parliamentary expenses system. The only things that seem to qualify him for the position he holds is that he is friends with the Prime Minister David Cameron and that he has been kicking around in the Tory party for a couple of decades, by many measures the least successful period in the entire history of the UK Conservative party. He has risen to the top of a Tory party that is bereft of talent and competence. He certainly hasn't risen because of any noteworthy achievement in the private sector or public service, neither has he risen for his economic expertise, of which he seems to be desperately lacking. In this section I'm going to outline some of the many criticisms of George Osborne; identifying some of the many people and institutions to have criticised George Osborne's stewardship of the UK economy. I'll start off with my own extensive criticisms before moving onto to list some of the others. Osborne often returns to the narrative that record low prices in the UK bond market represent unprecedented levels of confidence in his fiscal austerity agenda, rather than simply being the result of unprecedented monetary policy (sustained 300-year low Bank of England interest rates and £375 billion in Quantitative Easing cash distorting the bond market). This conflation of fiscal policies and monetary outcomes is unquestionable example of economic illiteracy. Another example of cherry-picked data based economic illiteracy, is his talking up of stock market performance as a key economic indicator. The problem with using share prices to estimate economic health is that if the majority of corporations are using tax-havens and transfer pricing to avoid UK taxation (98 of the 100 FTSE100 companies use tax haven based subsidiaries), the more growth there is in the corporate sector, the greater the flow of wealth out of the UK economy! Tax-dodging is rife, meaning that this inflation of corporate wealth does not come with increased tax revenues. In fact George Osborne has been slashing corporation tax and creating tax-loopholes in order to divert ever more cash into the re-inflation of the corporate bubble at the expense of his own tax revenues. The greater the expansion of the corporate sector under this "low tax, lax tax collection" regime, the more problems Osborne is going to face in balancing the budget deficit. Not only is it demonstrable that Osborne is unfit to be Chancellor of the Exchequer from his lack of relevant experience and the economic illiteracy of his pronouncements on the state of the economy, it is also apparent from the consistent failure of his ideologically driven economic policies. Osborne and so many blue tinted Tory party tribalists resort to their tiresome excuses, the lamest and most oft repeated being that "Labour wrecked the economy". OK, lets assume for a moment that the Great Neoliberal Lie is true, and that excessive state spending, not financial sector mismanagement and corruption created the economic crisis. This narrative still doesn't explain how in 2010 George Osborne and his neoliberal economic wonks at the Office for Budget Responsibility (OBR) were predicting 2.6% growth for the year 2012, yet Osborne's policies have led to negative economic growth of -0.1% for the entire year (a year in which the UK hosted the world's most prestigious and lucrative sporting competition). How are Labour to blame for this spectacular economic miscalculation from George and his team? Clearly they are not. In a previous article I demonstrated how naive "Osbornomic" assumptions about fiscal multipliers are demonstrably to blame for this flatlining of the UK economy. Firstly, lets begin with someone you would expect to be a vocal critic of Osborne; his political adversary, the aforementioned shadow chancellor. Ed is hardly what you'd call an economic genius, in fact he comes across as nothing more than a rather pompous political figure suffering from a bad case of bloated self-importance. When Osborne came to power, Ed set the Labour economic narrative at an unwavering mantra of "the Tories are cutting too hard and too deep". After 33 months of "Osbornomics", the sustained lack of economic growth demonstrates that Ed Balls was essentially right. This is a catastrophe for the Tories because "economic competence" is one of the very few public perception indicators where the Tories have a long historic advantage over the Labour party. Osborne's mismanagement of the economy has led to the quite frankly astonishing situation that Labour have completely overturned this public perception of Tory economic competence. The polls now show that Ed Balls and George Osborne are virtually neck and neck on public trust, with Balls actually eking out a slight advantage. What makes this shift in public perception so astonishing is the fact that it has come despite the Labour party presiding over the most catastrophic economic collapse, within the living memories of the vast majority of the British population. Osborne's inept management of the economy has led to the incredible situation where a clearly limited political clogger like Ed Balls actually looks savvy and competent in comparison. It is already clear from the decline in public trust, that Osborne is not popular with the public. In fact polls repeatedly show that he is by far the least popular Conservative minister, quite an achievement in a government stuffed with odious and highly unpopular characters such as Iain Duncan Smith, Eric Pickles, Michael Gove and Jeremy Hunt. It is quite clear from the polls that Osborne has become the biggest liability in the Conservative government. Not only are his economic policies failing badly, he has also introduced massively unpopular legislation such as the pasty tax, the static caravan tax and the 5% income tax cut for millionaires. His economic strategies have been described by members of his own party as "back of a fag packet stuff". Osborne is rightly considered to be the worst Chancellor of the Exchequer in at least 100 years by an ever growing percentage of politically aware people. For those of you that are unfamiliar with Max Keiser's work; he is a man that has done more to popularise economics reporting than probably any man since the dawn of the television age. Max is a right-wing capitalist libertarian, the kind of guy that you would expect to support the Tory party, and approve of a man like Osborne that often talks up his libertarian credentials. However, Max has an absolute loathing for corruption and incompetence. Max has lambasted George Osborne countless times, including calling him a "bare faced liar" and a "shameless exploiter of public economic illiteracy". It seems that one of the things that winds Max Keiser up the most is people who claim to be libertarians, but are actually more like adherents of Ayn Rand's lunatic pseudo-philosophy of pure self-interest and unrestrained greed. I'd put George Osborne firmly in the category of Randian neoliberals, those that treat economics as a matter of ideological certainty, rather than as a "soft-science" that is subject to interpretation and change. I'm not really a great big fan of David Blanchflower, given that he is a die-hard Quantitative Easing fanatic (the Bank of England's own research demonstrates that it redistributes wealth from ordinary workers, savers and pensioners to the uber-wealthy minority). However, despite our differences over QE, our opinions align very closely when it comes to the failure of George Osborne's ideological austerity experiment. Blanchflower is one of the few mainstream media pundits to have picked up on the fact that Osborne's catastrophically inaccurate fiscal multiplier assumptions are responsible for the current economic stagnation (a point I've been banging on about since October 2012). He stated as much in an article in late January entitled "George Osborne is destined to be remembered as the most inept chancellor in British history". Vince Cable is regarded by many as some kind of economic sage, because he was one of the very few politicians economically literate enough to forewarn that the "easy credit bubble" was going to collapse. In my opinion he's more of a lazy optimist than a rigorous economic thinker, he's always chuntering on about "responsible capitalism" as if huge financial behemoths can simply be persuaded to act with a social conscience akin to the religiously motivated social progressives of the early industrial revolution (Cadbury's, Bourneville, New Lanark, Rowntree's, Saltaire...). This is fantastical stuff, the only way that gigantic multinational corporate entities could ever be reined in would be through regulations and forced breakups of the too-big-to-fail, moral hazard brigade. Vince is right about one thing though, his criticisms of George Osborne's economic strategy (or complete lack of it) are spot-on. In early 2012 a letter from Cable to George Osborne and David Cameron was leaked to the press. "there is still something important missing: a compelling vision of where the country is heading beyond sorting out the fiscal mess; and a clear and confident message abut how we will earn our living in future "
"we must lay out a strategic vision for where our future industrial capabilities should lie, and how to deliver it." Vince Cable is far from the only member of the current coalition cabinet to have criticised George Osborne's stewardship of the economy. In early 2013 the deputy Prime Minister admitted that the coalition had made a terrible economic mistake in slashing capital spending. Here's what he said. "I think we've all realised that you actually need, in order to foster a recovery, to try and mobilise as much public and private capital into infrastructure as possible." This is quite an astonishing admission. What Clegg is saying is that that there was a spirit of collective ignorance of economic history in the coalition cabinet, that has now passed. The lessons from history are absolutely clear that boosting spending on infrastructure projects is a tried and tested method for stimulating economic recovery. The most famous example being the "New Deal" in the US, but the post-war recovery in the UK actually makes an even more compelling case. What Clegg admits is that the entire coalition cabinet had been so enraptured with Osborne's ideological austerity agenda, that it's taken them almost three years to recognise these obvious lessons from history. At least Clegg is now prepared to admit that the government that he is part of, bears the burden of responsibility for allowing Osborne to push on with his catastrophic ideological austerity experiment. Osborne recognises no such thing, and continues to insist that the economy is in fine shape, despite negative economic growth,, a looming triple-dip recession, numerous, record trade deficits, inflation soaring above average wage rises for 33 consecutive months and the loss of the AAA credit rating for the first time in over three decades. Criticism from other politicians is not limited to the Labour opposition and the Lib-Dem members of the government. The Tory Mayor of London has also waded in to give his old Bullingdon Club mate a kicking. In early 2013 he urged Osborne to drop the "hair shirt agenda" and to "junk the rhetoric of Austerity". This is hardly a radical change of tune from Boris, he's been making similar noises since at least July 2012 (when I wrote about his agenda). Boris clearly isn't as daft as he looks, the harmless floppy haired buffonery is actually a carefully crafted public persona. I'm convinced that he's angling for leadership of the Tory party, and by getting his boot in early, he's demonstrating to his fellow Conservatives and the public alike, that he's a true blue Tory man, but one with an alternative to Osborne's catastrophic ideological austerity experiment. Remember when that bunch of British so-called "business leaders" wrote that idiotic letter to the Telegraph cheerleading for Osborne's austerity experiment? Remember when right-wing business groups like the CBI and the BCC were cheering Gideon Osborne to the rafters back in 2010? Well they've changed their tunes now, they still cloak their statements in pro-Tory language but the message is absolutely clear, that they now want increased government spending and investment, rather than a continuance of the obsession with cost-cutting. You would have thought they'd be ashamed to make such a volte face, but it is absolutely clear that our so-called business leaders are a bunch of shameless bastards from the fact that British FTSE 100 directors awarded themselves a whopping average pay rise of 49% in 2011 while the rest of the workforce got a measly 1.4% increase (miles below the 5% rate of inflation that year). Another right-leaning organisation called the Centre for Economics and Business Research have made a number of statements which, although thickly coated in the expected pro-Tory patina, clearly demonstrate the fact that they accept that Osborne's ideological austerity experiment is failing. In January 2013 the correctly predicted that the UK would be stripped of the AAA credit rating (hardly a remarkable prediction, since the UK's AAA rating was put on "negative outlook" by all of the three ratings agencies at the back end of 2012). What is worse, is that they are now claiming that Britian's soaring budget deficit will not begin to fall for at least ten years, making an absolute mockery out of Osborne's intention to eliminate the structural deficit in a single parliament. Even his right-wing cheerleaders admit that thanks to Osborne's economic mismanagement, the deficit won't begin falling until well into the third post-crisis parliament, if not the fourth. When right-wing economic foundations are predicting a lost-decade of low growth and rising debts, it's awfully bad news for a Chancellor that staked his reputation on rescuing the UK economy and eliminating the structural deficit over the course of one single parliament. The Paris based OECD like to describe themselves as the world's leading economic thinktank, however in February 2013 they pretty much admitted that they've been backing a dead horse in George Osborne. The OECD were guilty of ceaselessly promoting Osborne's austerity experiment all the way from 2010 through to the beginning of 2013, but then they suddenly seemed to wake up and recognise what a spectacular mess Osborne's been making. They have now joined the vast chorus of people and organisations calling on Gideon to slow down the rate of cuts, begin investing more in infrastructure and to focus more attention on creating employment and on protecting the poorest and most vulnerable from the effects of austerity. 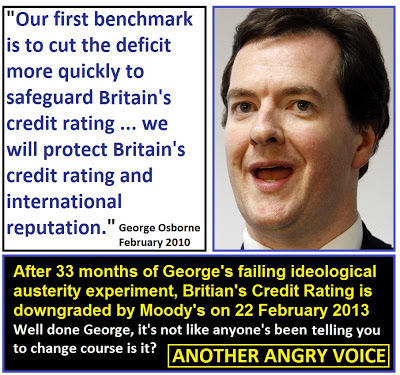 George Osborne repeatedly talked up the importance of protecting Britain's AAA credit ratings from the credit ratings oligopoly. To stake your reputation on the opinions of three such companies would seem to be bold to the point of foolishness. Remember these are the guys that that gleefully stamped toxic sub-prime junk with AAA ratings for the world's financial; institutions and pension funds to mindlessly consume. What's even worse is that they collected vast fees from the banks that created these toxic "financial weapons of mass destruction", a stunningly obvious conflict of interests. Anyhow, the writing had been on the Credit Ratings wall since the back end of 2012, when UK debt was put on "negative outlook" by all three of them (Moody's, Standard & Poor, Fitch) and then on 22 February 2013 the UK was officially downgraded by Moody's, the first time the UK has dropped out of the world's elite group of nations (the ones rated as super-safe investments) since 1978. What makes this so much worse is the way he ridiculed and chided Labour when the UK was put on "negative outlook" in the wake of the global financial crisis. Despite experiencing the worst economic collapse in the living memory of almost everyone, Labour managed to keep the AAA rating. That George has lost it, despite pinning his reputation on keeping it and after chiding Labour for being put on "negative outlook" looks like a truly spectacular demonstration of political hubris. Yet another financial institution to voice their deep concerns over Osborne's self-defeating austerity experiment is the investment bank described by Matt Taibbi as "a great vampire squid wrapped around the face of humanity, relentlessly jamming its blood funnel into anything that smells like money". One would have thought that Osborne's banker friendly stance would have made him immune from criticism from such an organisation, but it is becoming clear, even to the bankers he is intent on serving, that Osborne's ideological austerity experiment is damaging the UK economy and curtailing their profit making potential. "Based on my business experience, if what you thought was not delivering what you expect to be the outcome, surely you have to change what you thought a little. At a minimum, a repositioning of the stance, if not a full change." Perhaps the most damning criticism of all comes from the IMF. Not only are they the world's most powerful pushers of neoliberal orthodoxy they have also been recipients of £40 billion from the UK since Osborne became chancellor in 2010. The IMF are notoriously hesitant to criticise the countries that donate the funds they use to force neoliberal measures onto struggling economies (via neoliberalisation conditionalities on their "rescue" loans). This reticence hasn't stopped them from criticising Osborne's self-defeating austerity experiment though. "For the advanced economies, there is an unmistakable need to restore fiscal sustainability through credible consolidation plans. At the same time, we know that slamming on the brakes too quickly will hurt the recovery and worsen job prospects. So fiscal adjustment must resolve the conundrum of being neither too fast nor too slow." "If growth should fall significantly below current projections, countries with room for manoeuvre should smooth their planned adjustment over 2013 and beyond... This includes the United Kingdom"
"We've never been passionate about austerity. From the beginning we have always emphasised that fiscal consolidation should be slow and steady. We said that if things look bad at the beginning of 2013 – which they do – then there should be a reassessment of fiscal policy"
If the most powerful right-wing organisation in the world is taking the extraordinary stance of explicitly advising George Osborne to abandon his ideological austerity experiment, despite the fact that Osborne supported Christine Lagarde's nomination as head of the IMF and has poured £40 billion into their coffers, there is obviously something desperately wrong with his agenda. The IMF simply don't criticise their major donors like that. It doesn't matter who is criticising him, whether they are motivated by political expediency or by the overwhelming evidence that "Osbornomics" is failing disastrously; whether they come from the political left or the political right; Osborne's response is always the same: He talks of there only being one true course of action, uses rhetoric to dismiss economic concerns, cherry-picks fragments of economic data to create a misleadingly rosy interpretation of the state of the economy and invokes soundbytes like "difficult decisions" and "sticking the course". The evidence is absolutely clear; due to his economic illiteracy George has been reading the economic map upside down. For nearly three years he's been steering the UK bus in the wrong direction, and his only response to all the passengers and bystanders desperately shouting that he's heading towards an economic cliff is to waffle some incoherent garbage about how "we mustn't lose confidence" and stick his foot even harder down on the accelerator. The fact that he repeatedly fails to meet his own economic predictions, casually makes £1.2 billion calculation errors and steadfastly refuses to listen to reason is bad enough, but the worst thing of all is that he seems politically untouchable. It doesn't matter how much worse things get, David Cameron is such a weak leader that he simply won't lose face by giving his old Bullingdon Club chum the boot. There is one potentially positive aspect to all of this carnage; people are re-learning the old lesson that it is impossible to "cut your way to growth" (especially when you have an ideologically driven and economically unqualified man in charge of fiscal policy). Of course the lessons from this debacle won't last forever, anyone that had ever picked up an economics textbook (of the kind not written by far-right neoliberal free-marketeers at least) would know that the "cut your way to growth" experiment has a long track record of failure, it's just that people forget the lessons of history like the Great Depression of the 1930s, as those old enough to actually remember the horrors of it gradually die off. Of course, Centuries of inductive evidence isn't certain proof of anything, however, one would have to be as foolish as the man himself to expect an economic illiterate like George Osborne to be the one to break such a long track record of failure.